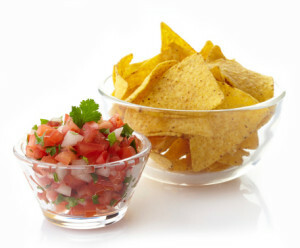 It is one thing to buy tortilla chips and salsa from the store, but it is entirely different to make them yourself! If you feel like keeping it fresh this summer, try making them at home. Guaranteed fresh, there really is no better way to go than homemade! Traditionally, tortillas take a lot of time to make, and are made from pressed corn in a clay stove over an open fire. 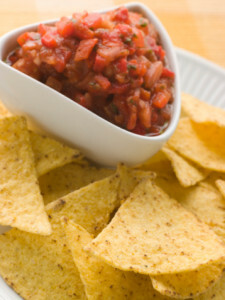 Salsa, on the other hand, boasts delicious flavor when made from fresh vegetables. Whether you are making chips and salsa for yourself, or for your guests at a dinner party, you will find that making the snacks homemade is way better than buying them from the store! With a pastry brush, paint a very light coating of oil on one side of each tortilla. Stack the tortillas greased side up in an even pile. With a sharp, heavy knife (or serrated knife) cut the stack in half, then into quarters, then into eighths. Separate the pieces and arrange them greased side up on a lightly oiled baking sheet. Toast the chips in a preheated 350 degree oven for about 10 minutes or until they are crisp and just beginning to brown lightly; watch them closely so they don’t become over baked. In a small bowl, combine [all] ingredients. Cover and refrigerate until serving. Serve with tortilla chips. Yield: 2-1/2 cups. If you are interested in learning more about Mexican food, check out our blog! Or, if you are more interested in eating Mexican food than making it, be sure to come by Acapulcos Mexican Family Restaurant & Cantina in one of our many locations in Massachusetts and Connecticut.